Do you think you know this already? Take the Quiz. The N5 uses 朝あさごはん (asagohan), 昼ひるごはん (hirugohan), and 晩ばんごはん (bangohan) to refer to the meals of the day. 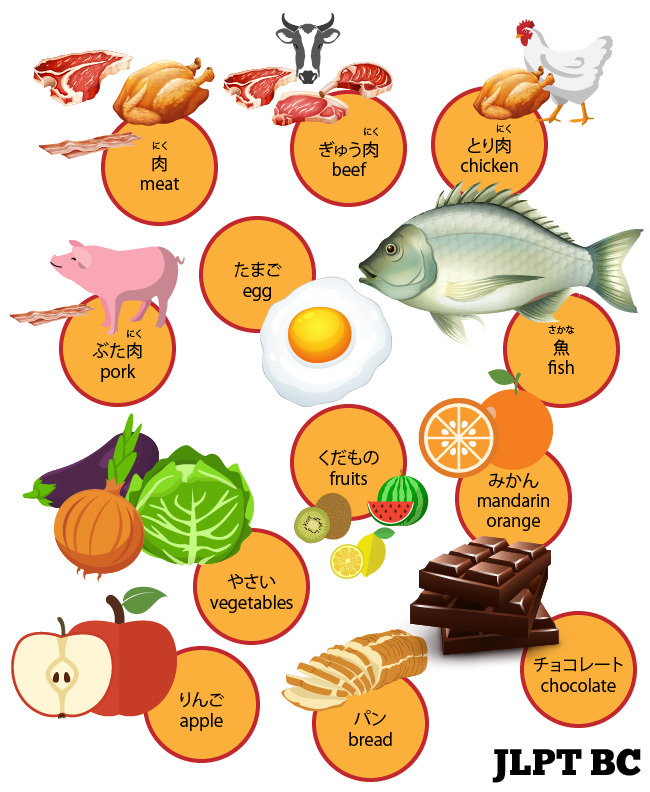 These are the most commonly used, but you may also hear another set of words – 朝食ちょうしょく(choushoku), 昼食ちゅうしょく(chuushoku), and 夕食ゆうしょく(yuushoku). These tend to sound more casual / conversational. You can write these words in all kanji (e.g. 朝御飯あさごはん(asagohan)), but it is not very common. It’s more common to write the last three moras in hiragana. If you were wondering about brunch, you can use the katakana word – ブランチ. These two words seem to refer to the same thing. But, 飴あめ(ame) is usually used for hard candies. I popular treat you can pick up at any neighborhood convenience store is のど飴あめ(nodoame), which are a type of sweet throat lozenge. のど(nodo) means throat and 飴あめ(ame) means candy, so it is literally throat candy. お菓子かし(okashi) on the other hand, has a much broader meaning. You can use it to talk about hard candies as well as other snack like foods. There is a special kind of お菓子かし called 和菓子わがし(wagashi) that are eaten with macha during tea ceremony. The kanji 和わ(wa) is often used to describe something ‘Japanese’, so you can think of these as ‘Japanese sweets’. Kyoto is particularly famous for its unique kind of 和菓子わがし and macha. 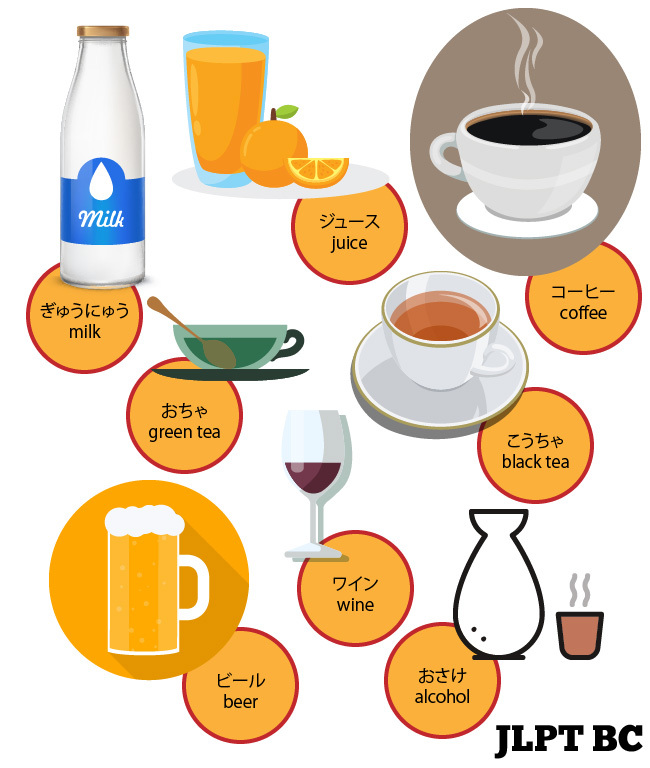 You basically have 3 types of drinks in Japan – お酒さけ(osake), お茶ちゃ(ocha), and ジュース(jyuusu). You might be thinking that there should be another category for soft drinks there, too. However, drinks like coke or ginger ale are commonly listed as ジュース on menus in Japan. And although sake in English refers to a particular kind of liquor, in Japan お酒さけ refers to any kind of alcoholic beverage. The liquor made from rice that we know as sake is actually called 日本酒にほんしゅ(nihonshu). Keep in mind that ご飯はん(gohan) can also just refer to a meal like the words mentioned above for breakfast, lunch and dinner. お弁当べんとう (bentou) are the typical Japanese lunch. Starting in kindergarten, kids and adults bring their lunch to school or work in small 弁当箱べんとうばこ(bentoubako), or bento boxes. These self-contained meals tend to have a lot of things in common. Most likely they are 3 parts rice, 2 parts vegetables, and 1 part meat or seafood. The best bentos will typically have 3 colors – green, yellow, and red. Commonly you will see green peppers (ピーマン, piiman), fried egg (卵焼たまごやき, tamagoyaki), and a few whole cherry tomatoes (トマト, tomato) or weiners (ウインナー, uinnaa). There are, of course, many variations on this theme and a simple google search will reveal all sorts of colorful and creative variations on how to make a bento. And there is an enormous selection of accessories that can be used in bentos from ornamental plastic toothpicks to nori (seaweed paper) cutters. I want cold (green) tea. At chain coffee shops like Starbucks or Tully’s, they use the katakana words ホット (hot) and アイス (ice, as in iced coffee). Note that this phrase uses a lot of formal language. First, 注文ちゅうもん(chuumon), order has the honorable prefix ご(go). Then, instead of using 決きまる(kimaru), to decide in polite or masu form, it is in a more formal form. To make this structure you simply need to take the masu-stem and put the honorable お(o) in front. This phrase and this grammar is not used on the N5. Which is better (for you), juice or coffee? Are you ready to test your knowledge? Take the Quiz.